The Boston Red Sox earned a 1-0 lead in the American League Division Series after defeating the New York Yankees 5-4 at Fenway Park on Friday. 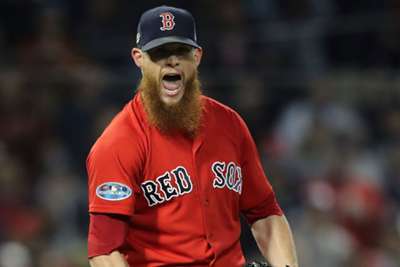 Boston had 5.3 innings of two-run ball from Chris Sale and Red Sox pitchers combined to strike out Giancarlo Stanton four times, including once with the bases loaded in the seventh inning and again with a one-run lead in the ninth. Aaron Judge went three for five with a home run in the ninth which cut the lead to 5-4, but Craig Kimbrel struck out Stanton and Luke Voit to close out the game-one win. The Yankees had every chance to cut into, tie or take the lead away from the Red Sox in the sixth and seventh innings. They loaded the bases in both frames and did so with no outs in the seventh. But, they managed just one run when the bases were loaded and left six runners on between the chances. It was unexpected, too, because the first batter who came up with the bases loaded against Brandon Workman was Gleyber Torres. The rookie infielder batted .538 (seven for 13) with the bases loaded during the year. He did a good job to work the count, but Workman managed to drop in a nasty hook to strike him out to end the inning. Then in the seventh, New York had the bases loaded with no outs for Stanton. The 2017 National League MVP has not been bad this year with the bases loaded (five for 20 with 15 RBIs), but he struck out and was followed by another two outs to end the inning. The Yankees may not have been individually terrible in bases-loaded situations this season, but collectively they were not great finishing the year 20th in batting average with the bases loaded (.253). Despite that, New York were still fifth in RBIs and runs scored in said situation so the Yankees tended to come through during the year — just not in game one. New York did not get J.A. Happ solely to beat Boston in the playoffs, but the Yankees had to feel confident with him starting on Friday as he has a career 8-4 record with a 2.98 against the Red Sox. But that pitcher did not show up for the Baby Bombers though, as the 35-year-old was run off after two-plus innings with four hits and five runs. The game was all but over when J.D. Martinez smacked a three-run homer off him in the first inning. Happ might get a chance to redeem himself as he did not throw that many pitches and he has been great at Yankee Stadium this season, but that start will not give manager Aaron Boone a ton of confidence to put him back on the mound against Boston. There is no way around it, the Red Sox's bullpen was horrifying. They may have managed to allow just one run, but Ryan Brasier was rattled, Workman laboured and Matt Barnes struggled to find the plate. The situation was so dire, manager Alex Cora used game three starter Rick Porcello in relief in the eighth inning. He did not use Joe Kelly and he passed on Steven Wright as well. There was very little confidence there in the arms out of the pen and that was clear as day. When this series heads to New York the intensity will only get worse for the Red Sox. If Boston's relievers are not up to the task in those games this series could take a drastic turn.